Between his father’s sudden—and rather suspicious—generosity, and his own rash promise to help Christine plan her wedding, Percival Endicott Whyborne has quite enough to worry about. But when the donation of a mysterious codex to the Ladysmith Museum draws the attention of a murderous cult, Whyborne finds himself in a race against time to unlock its secrets. Meanwhile, Griffin has a case of his own: the disappearance of an historic map, which quickly escalates to murder. Someone is sacrificing men in dark rituals—and all the clues lead back to the museum. 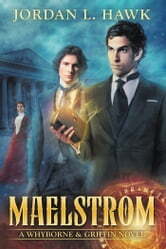 Maelstrom is the seventh book in the Whyborne & Griffin series, where magic, mystery, and m/m romance collide with Victorian era America. As usual, I was blown away by Jordan L Hawk's Whyborne & Griffin, of course, I never expected not to be. The entire series has me on the edge of my seat but there was something about Maelstrom that had me perched on the edge that I might as well have sat on the floor because it took everything I had to stay on the chair. As always, Christine adds her unique brand of friendship and determination. I don't do spoilers but I will say there came a point that I was yelling "NO! NO! NO! ", the rest I will let you discover for yourself and trust me, you will want to find out. Can't wait to see what she has planned for their next adventure.